Signed as a free agent on Sept. 28, 2016. Calgary originally signed Law as a free agent on Oct. 1, 2012, and he remained with the club through the 2013 season. He then signed with the National Football League’s San Diego Chargers on Feb. 26, 2014, and played 17 games with the Chargers over the 2014 and 2015 campaigns. Law attended training camp with the Seattle Seahawks in 2012. (Calgary) Law made nine starts at defensive end during the regular season and recorded 16 tackles including two tackles for loss, four sacks and one forced fumble. He had a season-high six tackles in a Week 5 game against Ottawa and picked up a sack and a forced fumble in Week 17 at Montreal. Law started both post-season games and recoded a total of five tackles. He was placed on the six-game injury list in August and returned to action in October. (Calgary) Law spent the entire regular season on the six-game injured list after suffering a broken leg in a pre-season game. He was on the one-game injury list for the Western Final and the reserve list for the Grey Cup. (Calgary) Law played four regular-season games and had nine tackles including one tackle for loss, three sacks and one fumble recovery. He started in the Western Final and had two sacks and also started in the Grey Cup, recording one tackle and one knockdown. (Calgary) Law appeared in 16 games for the Stampeders and made 15 starts. He was third in the CFL with 14 sacks to go with 44 defensive tackles — including three tackles for loss — six special-teams tackles, one pass knockdown and one forced fumble. His season included four multiple-sack games. Law had a season-high six tackles as well as two sacks in the Labour Day rematch game against the Edmonton Eskimos. Law also played in one playoff game and had two defensive tackles and one special-teams tackle. 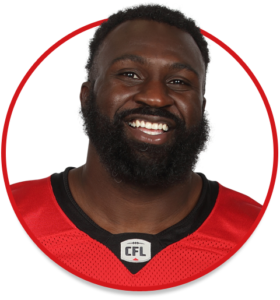 (Calgary) A late-season addition, Law quickly made an impact as he made four tackles, including two tackles for loss, and one sack in his first two regular-season games. He had two tackles for loss and a sack on Oct. 26 against BC. He also had two special-teams tackles. Law was in uniform for all three post-season games including the Grey Cup and recorded two tackles and one special-teams tackle. Law played four seasons with the Southern Mississippi Golden Eagles. For his career, he recorded 191 tackles, including 54 tackles for loss, and 27.5 sacks. Law set a school record with 14 career forced fumbles. He was a first-team all-Conference USA selection in 2011 and a second-team selection in 2010. Law attended Sumter County High School in York, Ala., and was a three-year starter on defence. He also saw action at running back.